LEWISTON – It felt like the dark ages of Niagara basketball finally were over Tuesday at the Taps Gallagher Center. Granted, hope abounds at most introductory news conferences for head coaches. But this was more hopeful than most because the Niagara community was so eager to turn the page on the past six seasons and so excited about the new name running the Purple Eagles. New head coach Patrick Beilein didn’t disappoint. The 36-year-old son of University of Michigan coach and Western New York icon John Beilein spewed optimism to a crowd of about 400 gathered at the arena. Beilein knows about winning. As a player for his dad at West Virginia, he went to the Elite Eight and Sweet 16 of the NCAA Tournament in 2005 and 2006. As head coach of Division II LeMoyne the past four years, he compiled a record of 77-44 (.653) and went to three straight NCAA D-II Tournaments. The Niagara loyalists in attendance were ecstatic. There’s nowhere to go but up for Beilein. 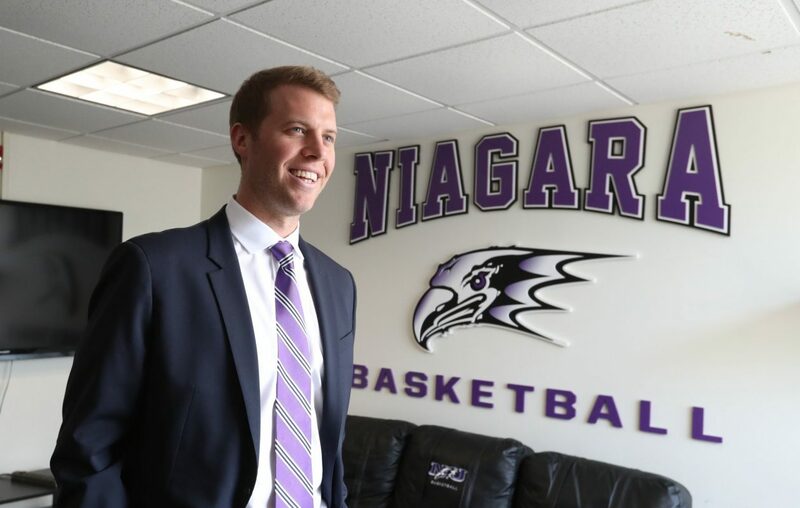 Niagara’s record the past six years under recently fired coach Chris Casey was 64-129. That was the fifth-worst winning percentage (.332) in the nation among the 280 active Division I head coaches who had coached at least 100 games. Niagara had 23 players transfer out of the program under Casey. The Purple Eagles are coming off a 13-19 season in which they finished 10th out of 11 in the Metro Atlantic Athletic Conference. Casey also came from Division II, with a .713 win percentage over three years. But Casey inherited a juggernaut of a program at Long Island University-Post that had won 81 percent of its games in the four years before he took over. Beilein built success at LeMoyne, which won 52 percent of its games the four years before he arrived. John Beilein has won 754 games in his career, including 89 at Canisius in the 1990s. He has taken four different teams to a combined 13 NCAA Division I Tournaments. He was in the front row at the news conference, along with his wife and Patrick’s mom, Kathleen. John Beilein, a Newfane native, retold the story of attending his first Division I college game at the Gallagher Center as a seventh-grader. Niagara graduates three senior starters, including its top two scorers and rebounders. The leading returning scorer is junior guard James Towns (10.5 ppg). Guards Raheem Solomon (7.5 ppg) and Marcus Hammond (5.8 ppg) both had promising freshman seasons. But Niagara’s front-court needs help. There currently are three open scholarships. As of today, Niagara easily is the last-place team in the MAAC. Beilein said he does not view the job as a colossal rebuilding project. Niagara has ranked in the bottom five in the MAAC on defense six straight years and was last in three-point defense three of the last six years. Niagara fans can expect to see the Michigan two-guard offense, with the floor spaced, one low post, hard cuts, backdoor action and ball screens. It requires skilled players who can pass well, line up on the perimeter and knock down 3-point shots. Patrick Beilein said his entire family was attending the Sabres game Tuesday night. “I’m going to get them a win tonight, you can mark my words, and I’ll hit the ground running tomorrow,” Beilein said. Clearly, he does not lack for optimism, a trait he’ll need in turning around the Purple Eagles.